Be part of an Agile – Scrum Team. Develop and maintain an in-house trav­eling appli­cation that uses on the backend a custom framework based on NodeJS, MySQL and for the frontend framework uses Angular 6. Take care of ongoing releases and future product evo­lu­tions. Apply what you know now and learn more, by being involved in all stages of devel­opment (from the archi­tecture to the imple­men­tation). You prefer informal working envi­ronment, with high level of autonomy. You like open and trans­parent com­mu­ni­cation, and flat orga­ni­zation. 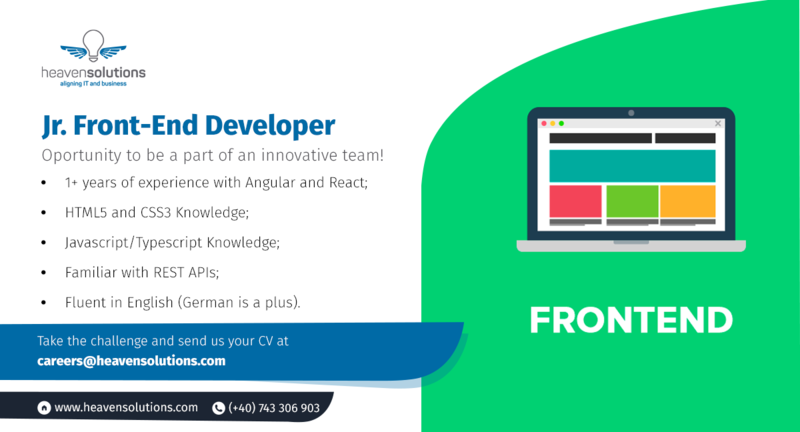 You are familiar and want to improve your skills in Angular, .Net, Java, React, SASS, CSS (Boot­strap, Material). You have the flex­i­bility to travel to our cus­tomers offices from Europe, if the project will require. Our offices are in Copou, near “La Placinte”, Str. Vasile Pogor, nr. 6. Take this challenge and send your CV at careers@heavensolutions.com.